Shanghai SIPG survives an almighty scare to sneak into the semifinals of the AFC Champions League 5-4 on penalties and break Guangzhou Evergrande hearts. Jubilant Shanghai SIPG players react after the penalty shootout win over Guangzhou Evergrande during their AFC Champions League quarterfinal, second leg at Tianhe Stadium in Guangzhou, Guangdong Province, on September 12, 2017. SIPG won 5-4 on penalties after Guangzhou won the second leg 5-1, to tie the overall score at 5-5 after extra time, following its 0-4 first-leg loss in Shanghai. Shanghai SIPG made rough weather of its tussle against Guangzhou Evergrande, surviving an almighty scare at Tianhe Stadium on Tuesday night, to advance to the semifinals of the AFC Champions League after a tense penalty shootout. SIPG was carrying a huge 4-0 first-leg advantage but the two-time Asian champion Evergrande almost replicated what Barcelona did to Paris Saint-Germain in the UEFA Champions League last season, when the Catalans also overturned a 0-4 first-leg deficit. The hosts scored two goals in each half of the second leg to level the total score at 4-4 in regulation. 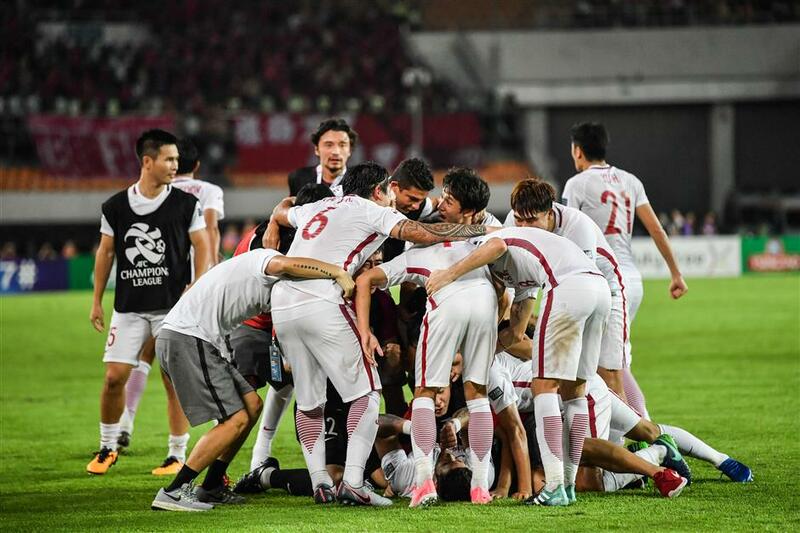 Each side scored a goal in extra time before SIPG claimed a heart-stopping win in the shootout; midfielder Yu Hai scoring the winning penalty. It was a thrilling game of high drama between the top two teams in the Chinese Super League. Luiz Felipe Scolari’s team began the second-leg home match strongly, making its intention clear with attempts on goal in the first 10 minutes. SIPG’s first look in on goal came in the 11th when Hulk’s shot went over the bar. The opener came in the 20th minute as SIPG defender Shi Ke missed the ball while making a clearance. Evergrande’s Brazil striker Alan Carvalho dribbled the ball past SIPG goalie Yan Junling to give the hosts the lead. After SIPG striker Lu Wenjun went close, Alan doubled the lead for the hosts with a header in the 34th, sending the 39,000 home fans into a frenzy on a humid evening in the Guangdong Province capital. Despite sustained pressure, SIPG was lucky to keep the 2-0 scoreline going into the break. But SIPG boss Andre Villas-Boas had seen enough and made changes at the beginning of the second half, replacing Lu Wenjun and defender Zhang Wei with Yu and Wei Zhen. The Portuguese, who like Scolari is a former Chelsea manager, raged on the sidelines as Evergrande pushed for a third, with sustained onslaught, often floating long balls from half-way down the pitch to strikers upfront. Villas-Boas used up all his substitutions by the 70th, sending one more defender Wang Jiajie. SIPG goalie Yan made at least three impressive saves to keep the goal safe until the 82nd when Evergrande’s Ricardo Goulart scored to extend the lead to 3-0. The hosts needed just one more goal to cancel their first-leg deficit, and that was what Goulart did in the last minute, the goal dragging the match into the 30-minute extra time. SIPG’s second-half substitution Wang was sent off in the first half of extra time after collecting a second yellow card for a bad tackle. Despite being a man short, SIPG sensed an unlikely victory when Hulk scored from a direct free kick in the second half of extra time, making the overall score a scarcely believable 5-4. But it was not to be for SIPG, after Brazilian Muriqui was felled in the box by Wang Shenchao, who was sent off, and Goulart buried the penalty with two minutes left on the clock for 5-5 on aggregate, his hat-trick and penalties. However, it was Goulart who missed Evergrande’s penalty — the first one — in the shootout, leaving him in tears afterwards as SIPG players and staff celebrated on the pitch. SIPG will face either of the Japanese teams Kawasaki Frontale or Urawa Red Diamonds in the last four. It is a first ACL semifinal for SIPG in its short history. There will be consolation for Scolari as his team is odds-on to retain the CSL title with SIPG a distant second. On Monday, Carlos Eduardo struck a fine hat-trick as Saudi Arabia’s al-Hilal stormed into the ACL semifinals with a 3-0 rout of UAE’s al-Ain. Victory at the King Fahd International Stadium in Riyadh gave the reigning Saudi champion and continental runner-up in 2014 a 3-0 aggregate win following their goalless draw in the first leg last month. Al-Hilal will take on either Qatar’s al-Ahli or Perspolis of Iran, who were playing their last-8, second leg in Doha, after a 2-2 draw in the first leg.